Homecam is a handy HomeKit app on iOS and tvOS that specializes in letting you view multiple video streams simultaneously. The latest version of Homecam builds on top of the app’s multi-feed view by adding new data layers, room control, and more to the Apple TV version. 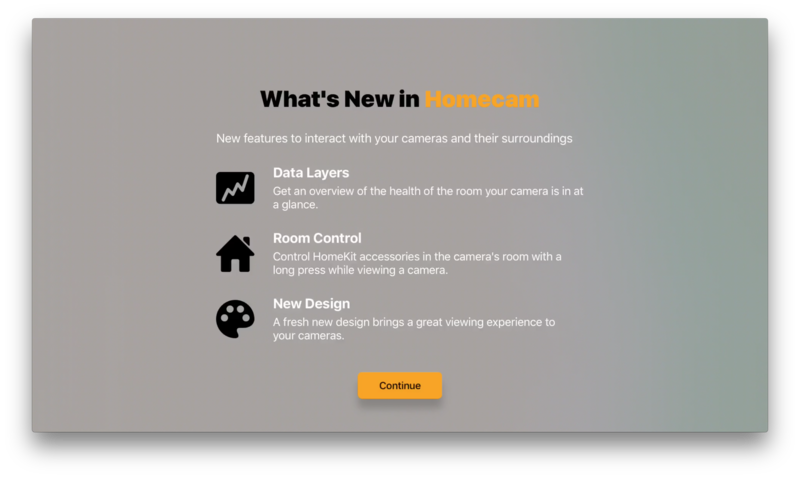 Homecam is essential for HomeKit cameras like the Logi Circle 2 and D-Link Omna 180 HD — not just for viewing playback on multiple streams at the same time, but also because Apple doesn’t offer its own Home app on Apple TV yet. Homecam cleverly lets you set your Apple TV to not timeout, too, so you can rely on the app for constant monitoring if needed. Data Layers – Bring a camera into full screen mode and you can view layers of data from surrounding HomeKit accessories such as temperature, humidity and air quality. Quick Switcher – Switch between cameras quickly using the new camera switcher, available with a swift swipe down, or even faster by tapping left or right on your Siri Remote. Room Control – With the newly added HomeKit controls, Homecam enables you to control surrounding accessories in the same room as your camera. Change the room’s lighting, adjust your thermostat and more. Auto Cycle – Set Homecam to automatically switch between cameras to allow you to keep an eye on everything in full screen over time. The ability to view data layers and control HomeKit accessories in the same room is quite useful on Apple TV. Data shown includes time, motion detected, and information from nearby HomeKit sensors including temperature and humidity when available. This lets you remotely see when a temperature is too low or too high from the Apple TV, then you can long press to access controls for HomeKit accessories in the same room. For example, you can view the front porch camera in the dark, long press and turn on the front porch light, then return to the video stream with better lighting. The new version also includes a sleek, TV-friendly user interface that supports quickly moving between cameras, and an Auto-Cycle feature lets you automatically switch between feeds passively. Homecam’s developer Aaron Pearce says he’ll bring new features introduced today to the iOS version in a future update. Homecam is $4.99 as a bundle for both the iOS and tvOS versions on the App Store and highly recommended for any HomeKit camera customers.